This was the first cheese I made in our new house, back in July. I made two wheels in that batch, and despite planning to give them a short aging time, things went farther than I planned. Thankfully, I think the cheese still came our great. If you remember, one of the wheels was studded with wild candy cap mushrooms, which have the unique property of tasting like maple syrup, curry, and fenugreek. And that maple flavor really shines! When I cracked the beeswax off this wheel, the smell was incredibly intense, with a sweet, heady aroma. Despite the random scattering of candy cap mushrooms throughout the wheel, their unique flavor seems to have completely permeated the entire cheese. Each bite is a maple-ly morsel of mushroom. The cheese itself is a bit on the sharp side, despite having a soft, springy texture that reminds me of a baby swiss. 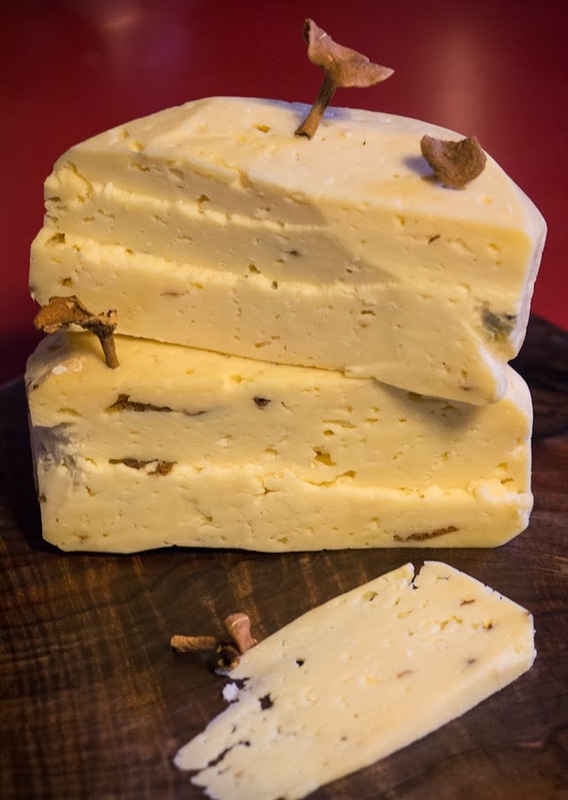 Mottled with small, birds-eye sized holes, the cheese has some of that grassiness you'd expect from raw milk, but the finish is all maple syrup, with a lingering sharp note at the end. I'm really pleased with this cheese and I think if I were to do it again I would stick with my initial plan and pull the wheel earlier in the aging process. I think a milder cheese, without a sharp bite, would let the unique candy cap flavor keep center-stage. Secondly, I enjoy the textural contrast of the mushroom in the paste of the cheese, but I might pulverize them into a powder next time. That would keep the cheese free of any chew bits of mushroom. Plus, it might look cool to have the powdered mushroom streaking through the middle of the cheese like Morbier or Humboldt Fog.